There are four Park SPA series pin spanners. 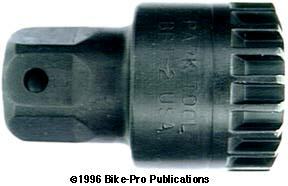 They are known as pin spanners because of their small area of contact with the B/B cups, but they are a very necessary tool for making the small final adjustments to really cinch the bottom bracket pieces firmly in the B/B shell. The SPA spanners are made of steel that is bent or folded in the middle to make a handle and machined ends to fit into the B/B cup fittings. The handles of the different models are dipped in a different colored vinyl to cushion the grip and make each SPA spanner color identifiable. The Green colored handle, known as the SPA-1 has a round pin, slightly under 3mm in diameter, at each end to fit in the holes drilled into the face of adjustable cups. The Red colored handle, known as the SPA-2 also has round pins at each end. These are smaller, just 2mm in diameter to fit in small holes drilled into the face of adjustable cups. The Blue colored handle, known as the SPA-3 is really for use on the lockring. Its ends are bent at a 90¡ inward angle, so with the spanner spread over and around the lockring it will slide into the square notches at opposite sides used on most lockrings to revolve and cinch it. The Yellow colored handle, known as the SPA-4, is also a lockring tightening spanner with square ends to fit lockring notches at an angle parallel with the SPA handle. It's used to tighten the cone race on one piece BMX cranks. Park makes a group of twelve flat, steel spanners, four of which have bottom bracket applications. Each is made from either 125/1000ths or 170/1000ths of an inch thick sheet steel that is die-cut to size and shape. They are each approximately 11 inches long, all are made in the USA. 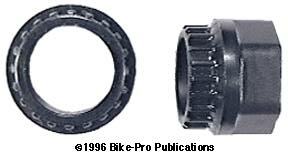 Remember, there are three aspects generally in the proper tightening of the bottom bracket parts. The first is the tightening of the fixed, right hand cup. The second is the tightening of the adjustable cup, usually with a pin ended spanner, and the last is the lockring that holds the adjustable cup in place. Now we will describe each. The HCW2 is made of .170" thick steel, with a 35mm oblong box wrench for small, 35mm fixed cups, and has a pivoting lockring spanner at the other end. The lockring hook is made as a separate piece and riveted yet remaining free to pivot while maintaining a single line of pressure. The HCW3 has an oblong, 36mm box wrench that fits most of fixed cups in use and at the other end 25mm open end wrench. The HCW4 has an oblong, 36mm box wrench that again fits most of the fixed cups in use and has a pin spanner at the other. The pins are the near 2mm diameter used on the Red SPA-2, and are fixed in the wrench at a 29mm on center distance. The pins are removable and replaceable. The HCW10 is technically a headset wrench, with a 35mm open end wrench at one end and a 36mm open end at the other.